This widely acclaimed documentary chronicles the Crow Indians’ century-long battle for survival. In spite of every effort by the U.S. government to assimilate the people and acquire their tribal land, the Crows have persisted — their language, family, and culture intact. They continue to live on their ancestors’ land in what is now southeastern Montana, but like tribes everywhere, the Crows’ future is not assured. Deftly interweaving interviews, fascinating archival footage, intimate scenes of never-before-filmed ceremonies, and stunning views of the Crows’ Montana homeland, “Contrary Warriors” brings the past into the present by focusing on the life of Robert Yellowtail, a 97-year-old tribal leader whose courage and brilliance saved Crow lands and traditions. At four, Yellowtail was taken from his mother and sent to a boarding school where it was forbidden to speak his native Crow language. He went on to teach himself law, and in 1910 he began a seven-year battle before the U.S. Senate to save Crow lands. 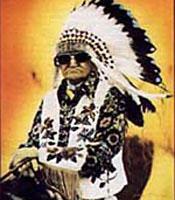 He succeeded and went on to spend 60 years shaping the course of the Crow tribe. The first Indian appointed by the Bureau of Indian Affairs to be Superintendent of his own tribe, Yellowtail used federal funds to restore traditions and bring back the buffalo. In his eighties, he was called on to unite and advise the tribe on the critical issue of coal development. Even at age 97, Yellowtail speaks out for tribal autonomy and economic rehabilitation. The film also focuses on the ceremonies and traditions and the spiritual strength and ties to the land that sustain the Crow people. The filmmakers spent three years with the Crow people while filming “Contrary Warriors.” The result is an emotionally powerful and authoritative film that reveals Crow life and history from the inside. “Contrary Warriors” will engage students and generate thought and discussion in a wide range of courses in Native American studies, American history and studies, cultural anthropology, and comparative religion. It was produced by Pamela Roberts and Connie Poten and co-produced by Beth Ferris. The eloquent narration is by Peter Coyote. The film is a Rattlesnake Productions presentation. ©2019 Berkeley Media, LLC. All rights reserved.